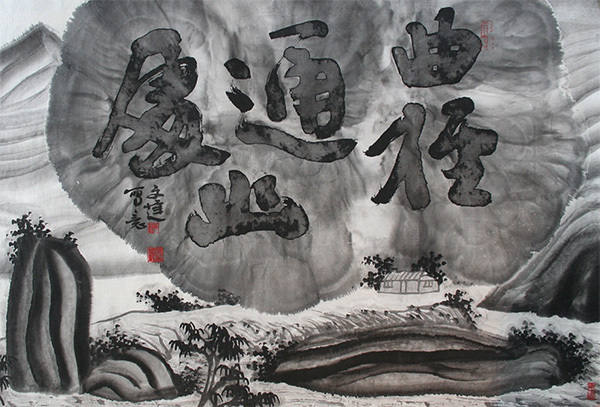 Ink painting originated in East Asia as the tradition of using carbon-based black ink and calligraphic brush painting techniques, and has continued to evolve as the basis for much contemporary works in the region. Ink is as synonymous with painting in the East as oil is with painting in the West. 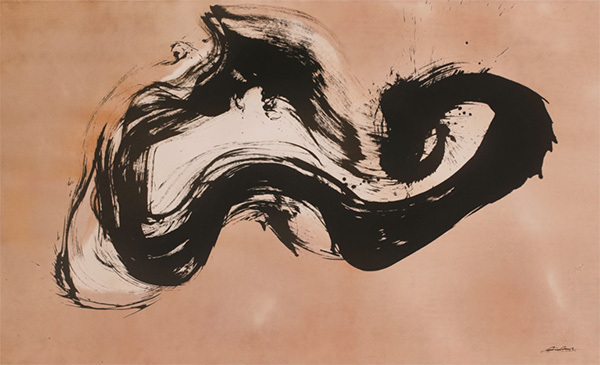 From traditional and historical, to contemporary, to avant-garde, these eight galleries offer us an opportunity to appreciate the rich spectrum of ink painting styles. 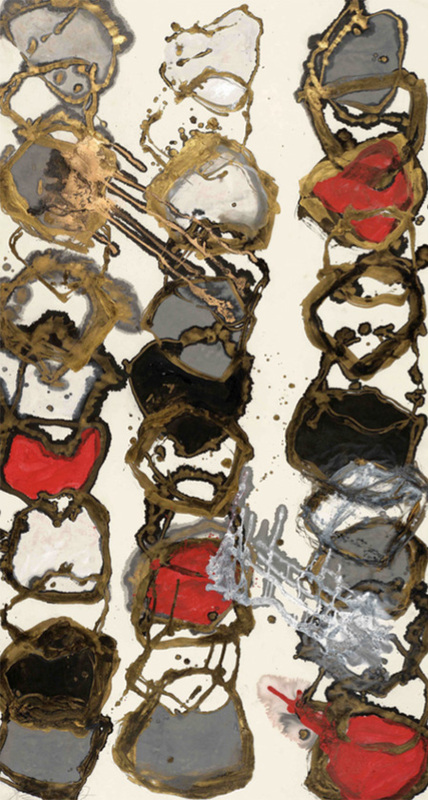 Michael Goedhuis will be exhibiting the ten best contemporary ink painters from China. The exhibition will describe, through the works of these ten leading artists, how Chinese contemporary culture is being transformed via a profound understanding of Chinese historical civilization. Gu Wenda, Li Huayi, Li Xubai, Liu Dan, Lo Ch’ing, Qin Feng, Qiu Deshu, Tai Xiangzhou, Wang Dongling and Wei Ligang are creating a new pictorial language which expresses the fundamentals of Chinese aesthetics and culture in ways which are relevant to today’s society in China and also to the developments in the West. Ink paintings emerged 1000 years ago from calligraphy: the sublime and central achievement of China. Calligraphy is executed in ink on silk or paper, with a brush. In order to master this brush on the absorbent paper, which tolerates no error or correction, the artist has to achieve a high degree of concentration, balance and control. Painting is an extension of the art of calligraphy. It is therefore, like calligraphy, linked to the sacred prestige of the written word. From China, Beijing’s East Art Center spotlights a handful of leading artists who, in various ways, incorporate the techniques of calligraphy into their pieces. 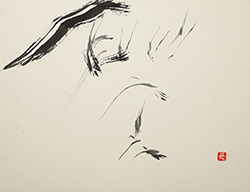 Bian Hong is a pioneer in the New Abstract Calligraphy movement originating in China. 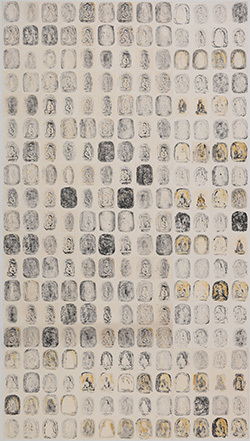 Her work subverts the Chinese artistic convention that calligraphy is more important than visual painting, and in her work, she approaches them as equivalent. The result is neither painting nor calligraphy, but a different creation altogether; pulled from modes of Chinese tradition and Western aesthetics and abstraction. Li Huichang is a master in oil painting, ink arts, and calligraphy, and has enjoyed a prolific career in China. 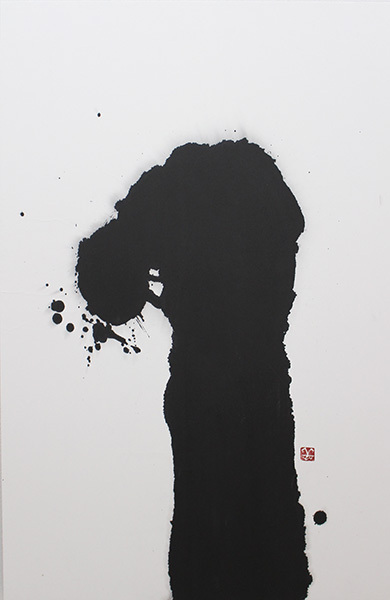 His works feature his mastery in ink, creating mysterious and ghostly images through traditional techniques such as po-muo (splash ink). Due to its difficulty to master, he is one of the only artists to continue practicing this technique. In “Realm,” Fan Peng’s body of work is a ritualistic comment on, and response to, the natural chaotic and social forces that shape much of the world. 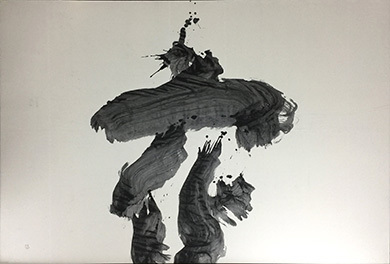 Li Zhihong uses traditional Chinese ink as his medium to present viewers with his inner perception of life, which he perceives as consisting of particles. 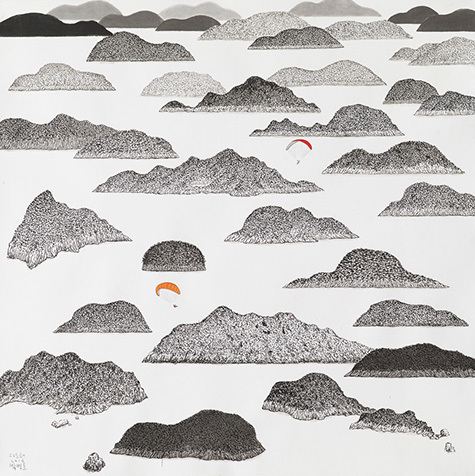 CM2 Space from Los Angeles presents the works of Beijing artist Wang Fei, one of the leading figures in Chinese experimental ink painting. 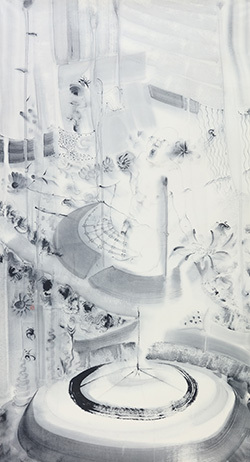 Fei balances conflicting principles of aesthetics from traditional Chinese ink painting, violating certain rules to elevate and align the work with contemporary principles. Highly emotional, his art presents dichotomies and travel between joy and anger; laughter and tears as well as life and death. He challenges established rules to create images that reflect the internal struggle of the human experience, the push and pull between rebellion and complicity. Cospace from Shanghai gives us the work of Yu Qiping, who uses meticulous craft and style to create ancient and modern landscapes and figures with surreal and ironic elements. From Japan, Kamiya Co,. 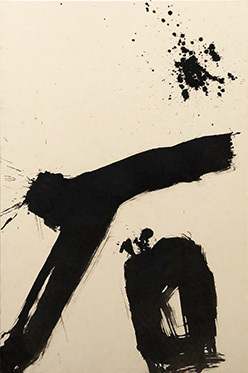 LTD exhibits the work of the late Yu-ichi Inoue, who gained an international reputation through the course of his career for his avant-garde calligraphic work. 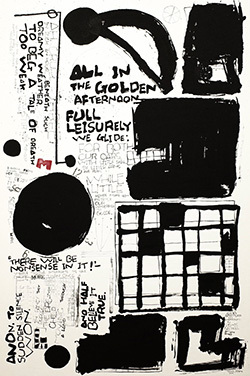 Robert Motherwell called him one of the few great artists from the latter half of the 20th century. 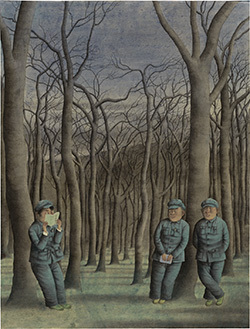 Inoue’s paintings depict calligraphy character-based subject matter, as well as his radicalization of traditional calligraphic techniques and styles. Also on view is the work of Shiro Tsujimura and Morihiro Hosokawa, who incorporate Zen teachings into their art practices and aesthetics. Gallery Kitai showcases a trio of artists who all use Japanese calligraphy as the basis of their current form of expression. 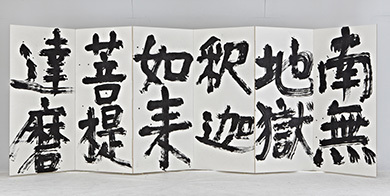 Mizuho Koyama is making a name for herself as a pioneer and liberator of sho (calligraphy) from the restrictive framework of the technique—creating a style different from past liberators such as Inoue and Shinoda. 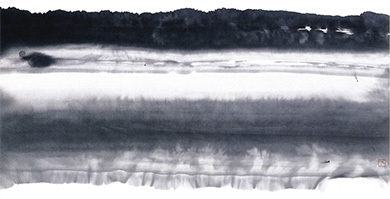 Reiko Tsunashima has exhibited all over the world, and is best known for her body of abstract landscape “Scene of Sumi,” which she characterizes as a true collaboration with nature. Miwako Nagaoka is a born calligrapher who is recognized as a pioneer in using it as a basis for an avant-garde aesthetic. Shumoku Gallery exhibits the work of Nagoya-based artist, 90-year-old Shoen Tominaga. 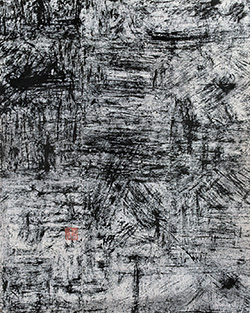 In the early 1950s, Tominaga rose to fame as a member of the avant-garde calligraphy group, Bokujin-kai (lit. 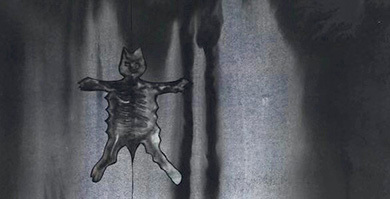 “Ink Man Group”), formed by Yu-ichi Inoue, Morita Shiryu and others. His work is characterized by exquisite balance of black and white achieved through extraordinary compositions and brushwork honed from decades of experimentation. Based in Los Angeles and Seoul, Baik Art highlights the work of South Korean artist Chuni Park. Inspired by natural landscapes, he recreates abstract paintings from memory of the places he’s explored and populates them with a cast of symbolic, often-recurring characters. 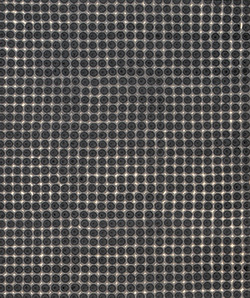 Featured will be Park’s large-scale, multi-panel installation, “Black Landscape,” which draws the seasons in black ink derived from pine soot. This will be the first time it is exhibited outside of South Korea. 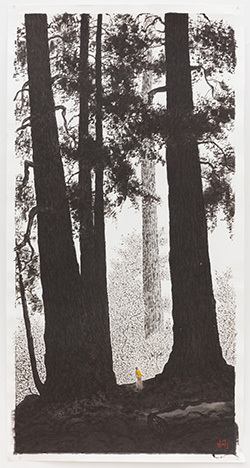 In the months leading up to the LA Art Show, Park is also traveling through California and the American West, visiting national parks like Yosemite for inspiration. He will premiere several new pieces inspired by his exploration of the Southwest, joining iconic landscape artists like Hockney who have tackled similar subject matter.